LEAGUE OF UNITED LATIN AMERICAN CITIZENS LULAC GLANCES October 1969 P.O. 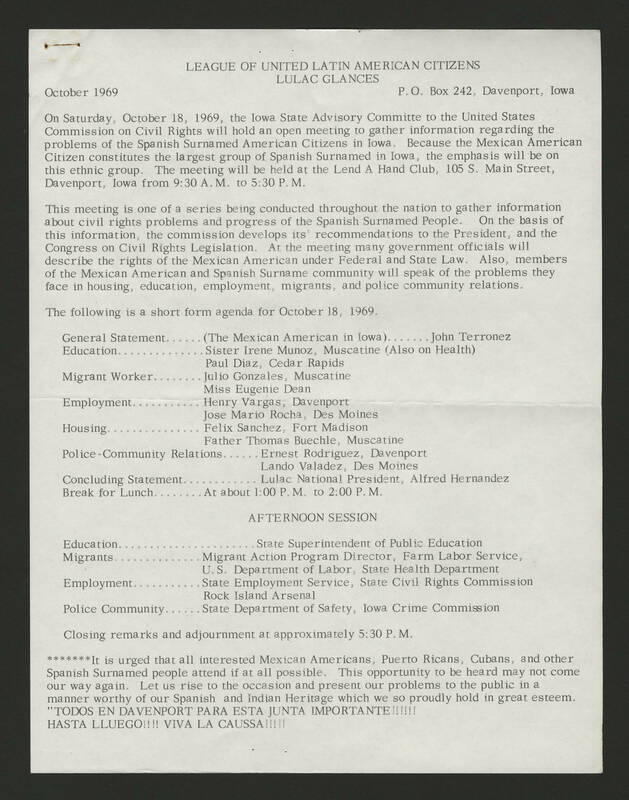 Box 242 Davenport, Iowa On Saturday, October 18, 1969, the Iowa State Advisory Committee to the United States Commission on Civil Rights will hold an open meeting to gather information regarding the problems of the Spanish Surnamed American Citizens in Iowa. Because the Mexican American Citizen constitutes the largest group of Spanish Surnamed in Iowa., the emphasis will be on this ethnic group. The meeting will be held at the Lend A Hand Club, 105 S. Main Street, Davenport, Iowa from 9:30 A.M. to 5:30 P.M. This meeting is one of a series being conducted throughout the nation to gather information about civil rights problems and progress of the Spanish Surnamed People. On the basis of this information, the commission develops its recommendations to the President, and the Congress on Civil Rights Legislation. At the meeting many government officials will describe the rights of the Mexican American under Federal and State Law. Also Members of the Mexican American and Spanish Surname community will speak of the problems they face in housing, education, employment, migrants and police community relations. The following is a short form agenda for October 18. 1969 General Statement . . . . . ( The Mexican American in Iowa ) . . . . . . John Terronez Education . . . . . . . . . . . . Sister Irene Munoz, Muscatine (Also on Health( Paul Diaz, Cedar Rapids Migrant Worker . . . . . . . . . Julio Gonzalez Muscatine Miss Eugenie Dean Employment . . . . . . . . . . Henry Vargas, Davenport Jose Mario Rocha, Des Moines Housing . . . . . . . . . . . . . . Felix Sanchez, Fort Madison Father Thomas Buechile, Muscatine Police Community Relations . . . . . . Ernest Rodriguez, Davenport Lando Valadez, Des Moines Concluding Statement . . . . . . . . . . .Lulac National President, Alfred Hernandez Break for Lunch . . . . . . . At about 1:00 P.M. to 2:00 P.M. AFTERNOON SESSION Education . . . . . . . . . . . . . . . State Superintendent of Public Education Migrants . . . . . . . . . . Migrant Action Program Director, Farm Labor Service, U.S. Department of Labor, State Health Department. Employment . . . . . . . . . State Employment Service, State Civil Rights Commission Rock Island Arsenal Police Community . . . . . . State Department of Safety, Iowa Crime Commission Closing remarks and adjournment at approximately 5:30 P.M. ******* It is urged that all interested Mexican Americans, Puerto Ricans, Cubans and other Spanish Surnamed people attend if at all possible. This opportunity to be heard may not come our way again. Let us rise to the occasion and present our problems to the public in a manner worthy of our Spanish and Indian Heritage which we so proudly hold in great esteem. "TODAS EN DAVENPORT PARA ESTA JUNTA IMPORTANTE!!!!!! HASTE LLEUGO !!!! VIVA LA CUASSA !!!! !